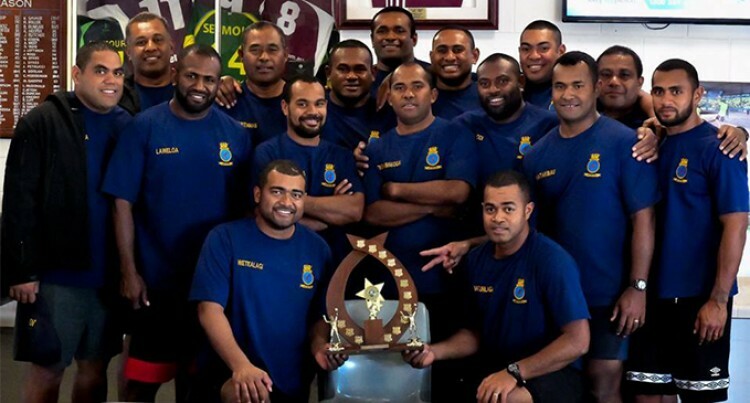 The Republic of Fiji Military Forces Navy division personnel who are part of the crew onboard the RFNS Kikau. The team is pictured here in Cairns, Australia. The crew won the inter-ship volleyball competition at HMAS Cairns. The RFNS Kikau is currently in Cairns waiting to sail to Darwin where the vessel will participate in Exercise KAKADU, alongside 18 other nations. Having completed a significant period in Cairns undergoing repairs the RFNS Kikau is back fighting fit and ready to get underway. Over the last three weeks the crew of the RFNS Kikau have been embraced by the Royal Australian Navy at HMAS Cairns and have enjoyed the attention of the Fijian Community. Other activities included playing for the Cairns Brothers Rugby Union Club. This no doubt boosted their win-loss ratio. The crew won the inter-ship volleyball competition at HMAS Cairns and participated in the Cairns and Regional Multicultural Association 2018 festival.